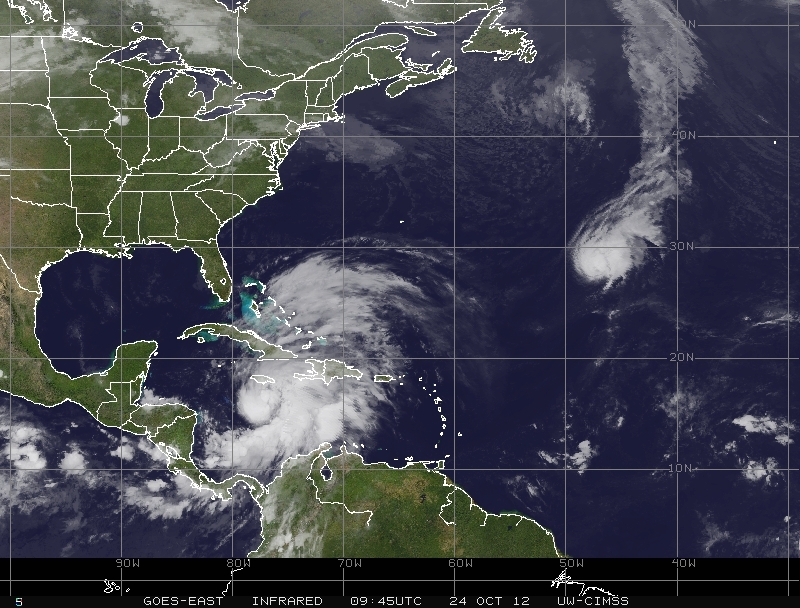 It may be late October, but the Atlantic hurricane season is still in full swing. At this time of year the strongest storms usually develop in the Caribbean Sea and this is where Tropical Storm Sandy has been gathering strength in the last couple of days. Sandy could reach hurricane strength before making landfall over Jamaica later today bringing winds of up to 75 mph and 150 to 300 mm rain. Sandy may not strengthen much once it hits the land but is then expected cross Cuba and the Bahamas, giving Haiti a glancing blow on the way. Sandy is then likely move north and bring strong winds and torrential rain to southeast Florida for a time before it develops into a deep Atlantic low pressure system with the possibility of bringing wet and windy conditions to north-eastern USA or eastern Canada early next week. Further out in the Atlantic Tropical Storm Tony has developed. Although no threat to land, Tony is the 19th storm of the 2012 Atlantic season equalling the tally of both the 2011 and 2010 seasons. Meanwhile, a tropical depression has developed in the Arabian Sea and looks set to bring rain to Somalia in eastern Africa in the next couple of days. If it does strengthen into a tropical storm, it will be the first storm in the northern Indian Ocean in 2012. In the western Pacific Tropical Storm Son-Tinh is bringing wet and windy weather to the southern islands of the Philippines including Mindanao. This will bring back memories of last year’s Tropical Storm Washi which caused devastation in this region. Son-Tinh is likely to continue its track across the South China Sea and make a further landfall at the weekend over Vietnam or southern China. This entry was posted in Met Office News and tagged 2012 hurricane season, Arabian Sea, Atlantic hurricane season, Bahamas, Caribbean Sea, Haiti, hurricanes, Jamaica, Sandy, South China Sea, tropical cyclone, Tropical Storm Son-Tinh, Tropical Storm Tony. Bookmark the permalink.